May to October: Please join us Sunday to Friday at 12:45 or Saturday at 11:30 for our tour . No reservations required for small groups (fewer than 8 people). Large groups (8+) require reservations- Book now! Our winery menu is a little different than most. Because we have beautiful grounds with rolling hills and vistas over looking the vineyards we thought it would be the perfect experience to stay at the Grange for a picnic lunch. We pack a classic wicker basket with a local cheese and charcuterie board and you get to choose the wine and location on the grounds for a lovely afternoon. Baskets are $35 and serve two to four people (wine not included in price). Reservations are only available for orders of 4+ baskets (approximately 8+ people). Note: Our entire patio can be reserved for groups of 20-30 people. Large groups (4+ baskets) require reservations- Book now! Small groups are welcome to stop in and enjoy a tasting flight at the bar. Groups of 8 or more need a reservation in order for us to make sure there will be space and time to attend to your group. All groups get a flight of 3 tastings of Grange wines as well as the time and attention of our knowledgeable staff. Complimentary tastings are given to wine club members and their guests as well as clients who purchase 3+ bottles. 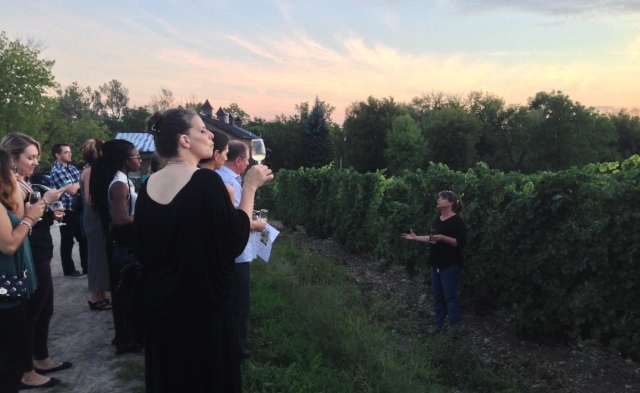 Large groups (8+) require reservations for tastings, tours or picnics. There may be a wait for tastings on a busy Saturday afternoon, please consider coming on Friday/Sunday or early in the day. We are pet friendly as long as they are on a leash and well behaved.